Activities are now over and as I wrote on my qrz.com page I saw some comments that I was deaf. Yes this is true as I have QRM from various sources here in my urban QTH, mainly from HV Line just opposite my road, ranking from S7 to S9+10. I let you imagine the fun. 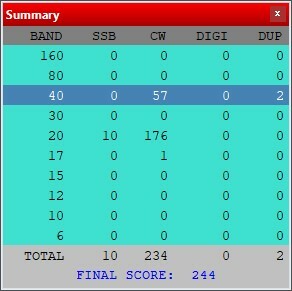 Log is updated to LOTW as for now, with 795 QSO records. Less CW, more ft8 now. In the last two days I have put the focus on CW activity again especially on 20 and on 40m. A total of 104 CW and 12 SSB QSO were made again with lot of struggle. Glad to have contacted old friends, some of them working on foreign countries such as LZ/S55M and DL/KU1CW. I am reaching the last day of activity, tomorrow the 9th of January, and I am now focusing on #FT8 contacts. Once more I do apologize for my poor sensitivity, but on the other hand I am glad that my signal is good audible with my simple Multiband vertical; this leaves lots of room for a station improvement in a new location in Bishkek during the current year (target).